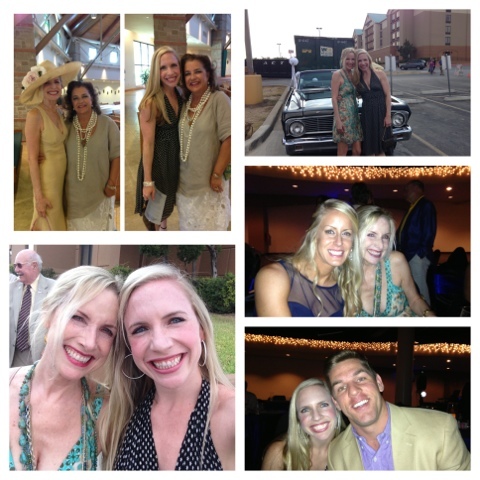 Over Labor Day Weekend, my Momma and I spent the weekend in San Antonio to celebrate the nuptials of my cousin Yale and his beautiful bride Kelly. I had a blast seeing all of my family, and we danced nonstop which is something I want people to do at Josh and my wedding too....Boogie on Down! 1. Momma. Aunt LaDonna, and Me at the Ceremony. Kelly wore her grandmother's dress for the wedding and gorgeous. 2. Walking to the Reception. 3. Posing in front of their get-away car. One of the highlights of the evening was the garter toss. Yale was a college football star. All of his football buddies were at the wedding and on the dance floor during the garter toss. Like any good quarterback, Yale decided to throw the garter on a football. Twenty guys pushed and shoved to try and get that garter, and my little cousin Sarah ended up grabbing it! Haha! She ran off with it and wore it around her belt the rest of the night. It was hilarious! 1. Yale and Kelly's yummy cake! 2. Aunt LaDonna and Uncle Robert have been married for 42 years! 3. Sarah with her garter. We had a fantastic time at the wedding, and my feet were in so much pain from dancing...but it was worth it! 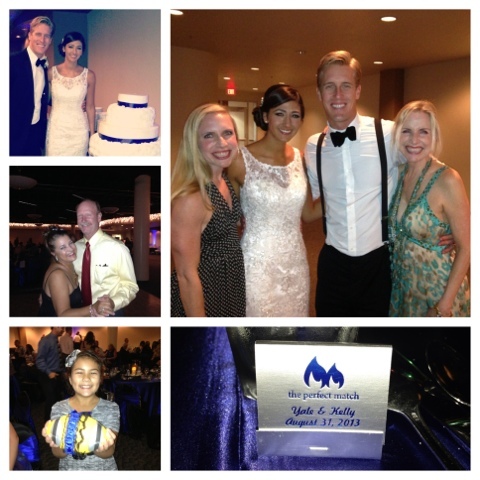 Congrats Yale and Kelly! Y'all really are "the perfect match"! Ooh her dress is gorgeous! I love it so so much (maybe because it looks sort of similar to mine?) Looks like you guys had tons of fun! I love the matchbooks! I actually thought about doing something similar for our favors initially. They were super cute! And I will actually use them which I love!